Police in the Netherlands have made seven anti-terror arrests over an alleged plot against the intelligence service and politicians. Security forces cordoned off government offices in The Hague as six men and a woman were detained in raids there, in Amsterdam and in nearby Almere. The suspects included one man recently acquitted of planning terror attacks. Interior Minister Johan Remkes said the investigation was probing an Islamic militant network, the Hofstad group. Militants had been plotting to attack the intelligence service's headquarter in The Hague and members of parliament, Mr Remkes said. The arrests come a day after renewed death threats against conservative members of parliament Ayaan Hirsi Ali and Geert Wilders - both outspoken critics of radical Islam - the BBC's Geraldine Coughlan reports. 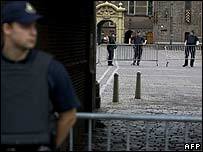 Early on Friday, riot police moved in to boost security at the Binnenhof castle in The Hague, where Prime Minister Jan Peter Balkenende and others have offices. The police have declined to comment on reports of gunfire during the operation, and no other details about the raids were released. Among those held was Samir Azzouz, a Dutch teenager of Moroccan origin who had been acquitted in April of plotting attacks on Amsterdam airport, government buildings and a nuclear reactor. "He is suspected of preparing attacks, together with other persons, on several politicians and government buildings," the prosecutor's office said on Friday. No details of the other six suspects, said to be aged between 18 and 30, were immediately given. Several alleged members of the Hofstad group are to stand trial later this year, charged with planning attacks against government buildings. The Netherlands has been on a terror alert since the London bombings in July. Police were injured by a hand grenade in The Hague last year when they arrested two terror suspects following the murder of Dutch filmmaker Theo van Gogh.